motivation, loyalty, and work habits of all its people." Get More Productive than Ever. Matthew Peters talks about Jeff Krug. People who believe that they have no time and who lack the awareness of values, time management and goal setting, tend to be followers. They procrastinate, they usually don’t care to contribute to the higher good, and they live in a comfort zone with no vision or plan for a better future. They live their lives in a blurry world where opportunities are missed and the promise of success is blocked. 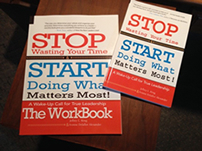 In Stop Wasting Your Time & Start Doing What Matters Most! : A Wake-Up Call for True Leadership, you will gain new awareness and learn how to use success strategies and the art of goal setting in deciding how you spend your time and thereby transcend the limits of possibilities for your future. True and good leaders understand and rely on these tools to achieve success. Are you a true leader? Are you prepared to make a significant difference in your life and the lives of those around you? If you are ready to find the answers within yourself; if you are willing to start doing what matters most; and if you want to leave a legacy of power, synergy, and higher values to the children of humanity, then this is the book for you. This is your wake-up call for true leadership. Does your organization have clear goals and objectives? Are your managers and executives doing their best? Would you like to manage others more effectively, master your time, deal effectively with change, and build confidence? Are you providing your people with the necessary tools to grow in their jobs? Copyright 2018, J.L. Krug & Associates, Inc.